In “What We Think About When We Think About Soccer,” author Simon Critchley explores, from a philosophical perspective, why soccer means so much to so many different people. Does soccer appeal to us because of tribal and national identity? What roles do racism and sexism have in the game today and how do they reveal themselves? How do fans interpret the game across cultures, languages, and genders? Critchley brings his formidable philosophy acumen into the world of soccer; the result is a unique analysis of the relationship between the game and everyone else. Using “phenomenology,” or “the description of what shows itself to us in our everyday existence,” Critchley attempts to “make explicit what is implicit in our experience.” And he does so quite successfully; clearly written with plenty of examples, the pages contextualize soccer in the socio-political climate of both yesterday and today, as well as relying on great thinkers of the past to better illustrate his points. Critchley admits to the corrupt transnational corporate structure of soccer, but instead of struggling through the dichotomy between the socialist form of soccer and its capitalist reality, he chooses to focus on the “delights” of soccer. Critchley devotes a chapter to Zinedine Zidane and the 2006 film “Zidane: A 21st Century Portrait.” He explores the role of sound, smell, and “sensate ecstasy” in experiencing soccer. For Critchley, the film works because of the purity of it; the viewer gets to hear the “sound of noise” and develops a close relationship with Zidane as he walks, jogs, and sprints on the field. Peppered throughout the book are beautiful black and white photographs illustrating the emotions of the game and the personalities he writes about. For any soccer lover with an interest in philosophy this is certainly the book for you. But even if you’re more of the former than the latter, Critchley’s clear writing style provides the reader with a deeper understanding, and love even, for the most thought-about sport around the world. 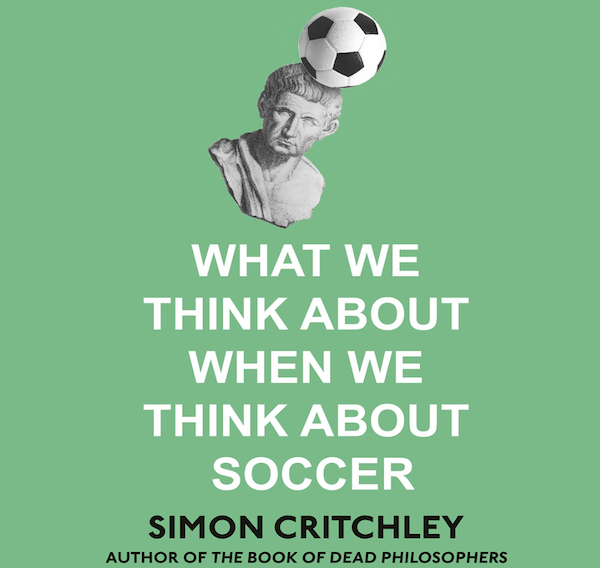 What We Think About When We Think About Soccer By Simon Critchley 204 Pages (Penguin). Available in hardcover ($13.36) and Kindle ($10.99) and Audiobook ($24.49).